THE LONGEST TOTAL ECLIPSE ON THE EAST COAST, AT 2 MIN. 36 SEC. To view a more detailed map, click here. Columbia, S.C., has been widely acknowledged by major media outlets such as the New York Times, USA Today, Forbes, the Washington Post and the UK’s Telegraph as one of the top cities nationwide for viewing the upcoming total solar eclipse on August 21, 2017. At 2:41 p.m. on Monday, August 21, 2017, visitors and residents who have gathered in the greater Columbia, S.C., area will experience the longest period of 100% total solar eclipse for a metro area on the entire East Coast of the United States: ranging from 2 minutes and 30 seconds to 2 minutes and 36 seconds of totality, compared with the national maximum of 2 minutes and 41 seconds that will be visible in smaller communities in the Central United States. NASA estimates that South Carolina could see an influx of up to 1 million visitors to witness nature’s grandest spectacle. In response, the Columbia, S.C., region’s best and brightest event planners, attractions, cultural institutions, sports venues, hotels, restaurants, shops and other entities are planning more than 120 eclipse events all weekend leading up to and during the Great American Eclipse of 2017. 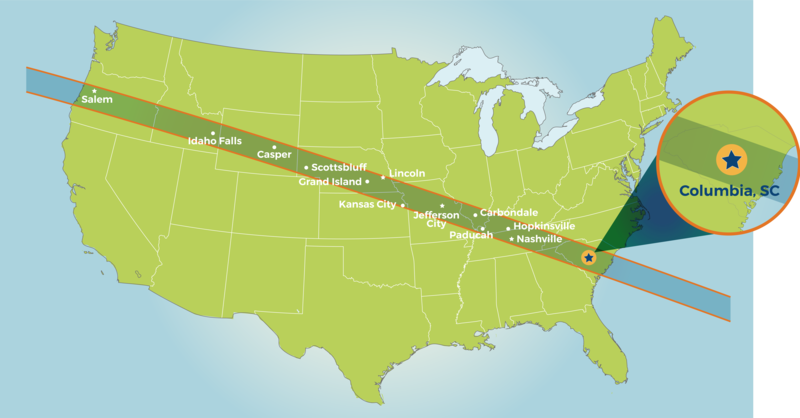 Columbia, S.C., is America's third largest city on the center line of the path of totality, with the longest total solar eclipse on the East Coast. Most of America will experience a partial eclipse, which does not produce the spectacular effects that only occur with 100% total eclipse. During a total solar eclipse, the moon appears to completely cover the sun, blocking its light, simulating darkness in the middle of the afternoon, and causing rare, awe-inspiring light effects to arc through the sky from around the corona of the sun. 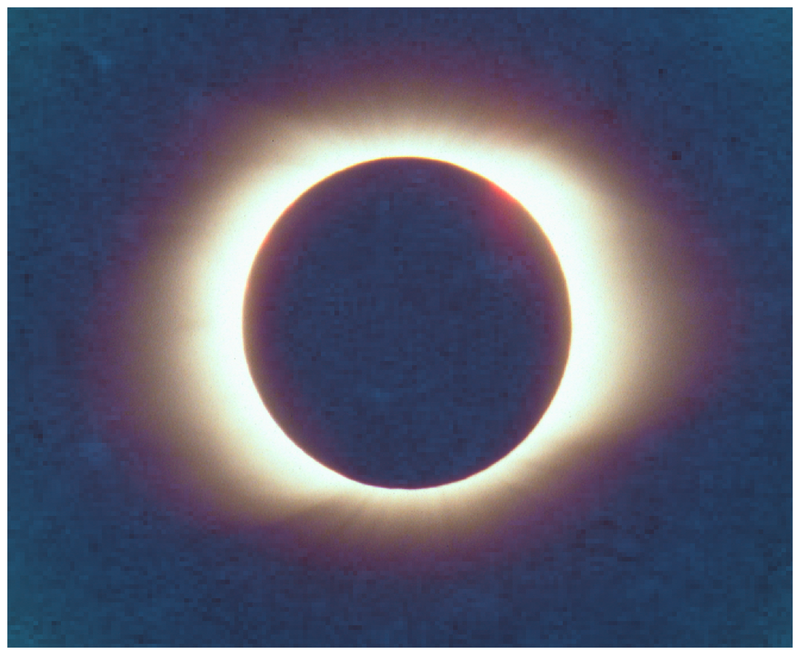 (The corona is only visible during a total solar eclipse; it is not something that can ever be seen unless one is within the path of totality during a TSE.) A litany of bizarre and delightful natural phenomena occur, drawing “eclipse chasers” who will travel from all over the world to experience the “mind-blowing” occurrence. Duration is key. It is a phenomenal piece of luck that the greater Columbia, S.C., area will see the longest totality for a metro area on the East Coast, at a range of 2 minutes and 30 seconds to 2 minutes and 36 seconds, depending on your location within the region. 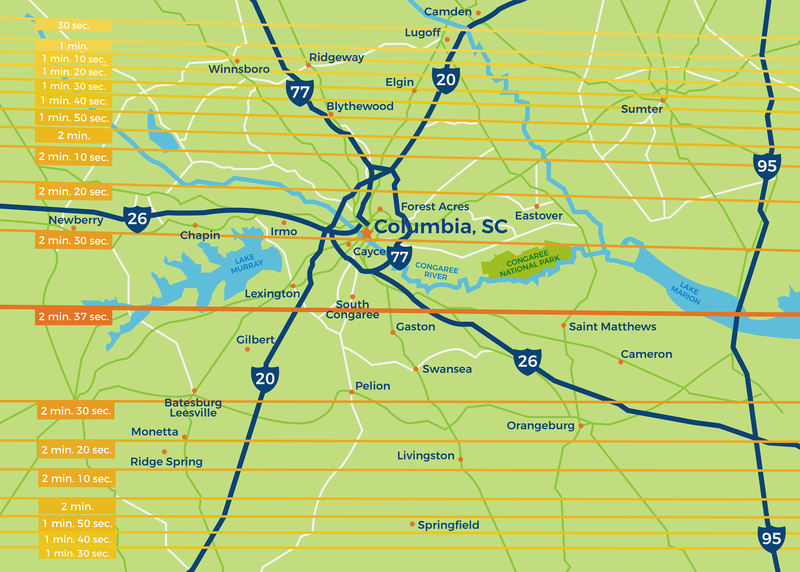 The city center of Columbia, S.C., the 3rd largest city on the center line of the eclipse’s “path of totality,” will experience 2 minutes and 30 seconds of darkness, while areas within 10-15 minutes of the S.C. State House can experience up to 2 minutes and 36 seconds of darkness. Two of our area’s most beautiful natural attractions, Lake Murray and Congaree National Park, are within or adjacent to the line of greatest totality. A solar eclipse occurs when the moon passes between Earth and the sun, causing the moon to temporarily cast its shadow on Earth. During a *total* solar eclipse, which is very rare, the moon aligns perfectly with the sun, causing darkness to fall, creating unbelievable effects in the sky. Imagine the sudden fall of darkness in the middle of the day. A 360-degree sunset around the entire horizon. The temperature drops 5-15 degrees. Bright planets and stars appear. Nocturnal animals stir. Starting at roughly 1:13 p.m. here in Columbia, S.C., a partial eclipse will begin to cover the sun, progressing toward totality. Then, at 2:41:50 p.m., darkness will fall quite rapidly, viewers can remove their eclipse glasses, and a rare and splendid light show will become visible around the corona of the sun. By 2:44:20 p.m., totality will have ended and viewers must put their glasses back on to look straight at the sun and see the outgoing partial eclipse. At 4:06 p.m., the partial eclipse is over. What else can you expect during a total solar eclipse? Learn more from NASA. Visitors to the greater Columbia, South Carolina area — known as “The Real Southern Hot Spot” — enjoy a diverse community and vibrant cultural scene with free festivals, farmer’s markets and public art events; rich historic offerings ranging from ancient Native American culture to the Revolutionary War to the Civil War to the Civil Rights Era and beyond; lush, natural surroundings studded by rivers and lakes; close proximity to the old growth forests of Congaree National Park; family-friendly attractions like Riverbanks Zoo and the South Carolina State Museum; a cutting-edge arts and entertainment scene anchored by the Columbia Museum of Art, Tapp’s Art Center and more; and our remarkably cool hospitality districts laden with affordable hotels, farm-to-table restaurants, independently owned shops and antique stores, and fab weekly happenings like Soda City Market every Saturday morning on Main Street. Learn more about all of the cool things to do in the greater Columbia, S.C., region at the Experience Columbia SC website. Ready to plan your Total Eclipse Weekend, and choose from more than 120 cool eclipse events, viewing parties and happenings from Aug. 18-21, 2017? Our Events page is where it’s at. Join us in Columbia, S.C., for a long weekend of eclipse-related activities in the Total Eclipse Capital of the East Coast! More than 120 special events are planned for the long weekend preceding the eclipse and eclipse day, Aug. 18-21, 2017. Highlights include a midday Columbia Fireflies Minor League Baseball game during the eclipse at the brand new, award-winning Spirit Communications Park at BullStreet; a weekend of astronomy activities and exhibits at the new South Carolina State Museum observatory; paddling on the Saluda River during the eclipse, a 5K run, and hands-on solar fun for kids at Saluda Shoals Park; a Sunday matinee of space-themed works by the S.C. Philharmonic; ranger-led eclipse tours at Congaree National Park; the Solar 17 viewing festival at the Lake Murray Dam; a major new public art/laser light installation at the Congaree River, titled “Southern Lights;” historical walking tours through the 12,000-Year History Park in Cayce; an Eclipse Eve Drive-In Movie night and huge Soda City Eclipse Festival at the Historic Columbia Speedway in Cayce; Solar Fest West at the West Columbia Riverwalk Amphitheater; a viewing event & paddle at Sesquicentennial State Park; a giant eclipse viewing tailgate event at the S.C. State Fair; a family-friendly viewing party on the grounds of Historic Columbia’s Robert Mills House; arts happenings by the Jasper Project and more at Tapp’s Arts Center; the Columbia Museum of Art’s popular Arts & Draughts party; a luxe VIP viewing party at Motor Supply Co. Bistro; a Lowcountry boil & paella party at City Roots urban farm; other special events throughout the region; and more. We have eclipse events for days. Literally. This will be the first total solar eclipse to make a path all the way across the U.S. in 99 years. The last total solar eclipse to pass over a portion of the continental U.S. was in February 1979, visible only from 5 states in the Northwest, and the last total solar eclipse visible from S.C. was seen only over the coastal region in 1970. The 1918 total solar eclipse was not visible from Columbia, S.C., and the year 2078 is the next time a total solar eclipse will be visible in the capital city. It is not an understatement to say that for all but the most dedicated “eclipse chasers” who travel the world to witness these celestial rarities, this truly is a once-in-a-lifetime experience. Eclipse experts have named Columbia, S.C., as a top viewing destination. The Great American Eclipse website has excellent detailed maps and information for those who’d like to dig deeper, and sites such as National Eclipse have extensive information as well. 12-time total solar eclipse veteran Dan McGlaun runs the Eclipse 2017 site, another solid resource for those seeking more information. Want to find eclipse viewing glasses in Columbia, South Carolina? Want to dive into our FAQs? 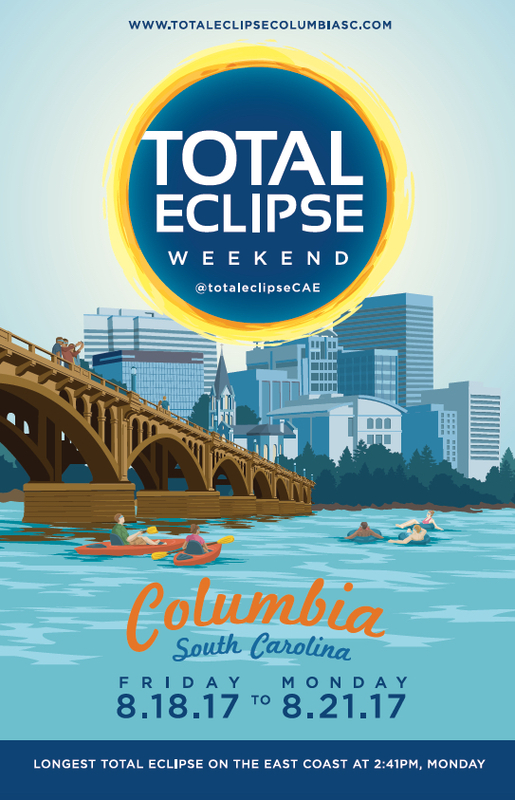 The Total Eclipse Weekend Columbia, S.C., initiative is spearheaded by a coalition of regional entities whose mission is to create an incredible, weekend-long experience for those witnessing the eclipse in the region. This group includes Experience Columbia SC; the City of Columbia; Capital City/Lake Murray Country visitors’ bureau; the South Carolina State Museum; the Columbia Fireflies Minor League Baseball team; and One Columbia for Arts & History. 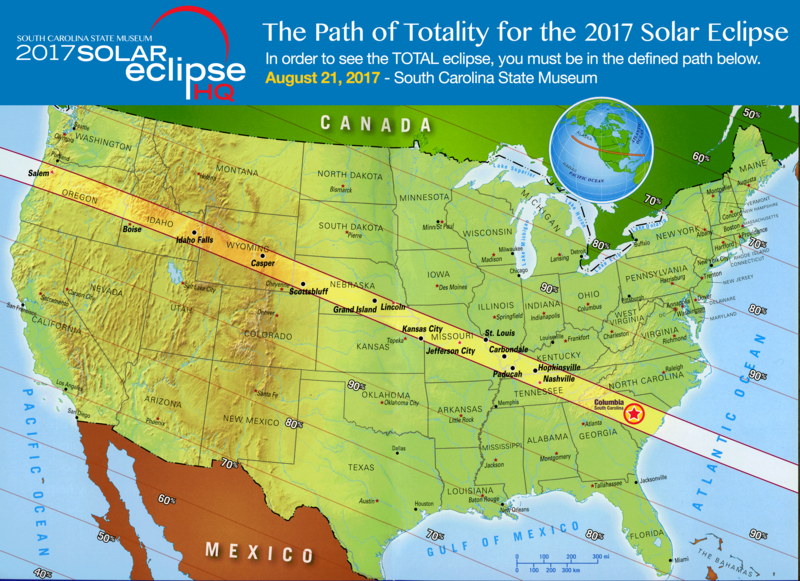 Visitors and residents in the greater Columbia, S.C., region will enjoy long weekend of eclipse-related activities hosted by area attractions, arts and culture organizations, restaurants, hotels, retailers, community groups and more, viewable at www.totaleclipsecolumbiasc.com. The effort is supported by the City of Columbia, S.C.; Experience Columbia, S.C.; the City of Cayce, S.C.; and Richland County. Want to learn more about the eclipse? Want to learn more about eclipse safety in S.C.? Want to stay on top of traffic in S.C.? Curious about what it takes to plan a community-wide eclipse viewing? Subject matter expert Kate Russo created this handy Community Eclipse Planning guide after experiencing multiple total solar eclipses around the world — and witnessing how cities successfully accommodated the influx of visitors for the big event.